Champagne Easter Sunday Brunch at the Gold Hill Hotel from 10 to 2 p.m.! 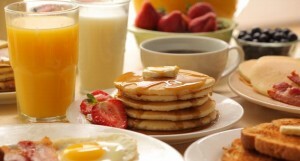 Traditional breakfasts served with potatoes as well as omelets and pancakes. All meals include a complimentary Mimosa, or a glass of Champagne, or Orange Juice & Coffee or Tea. Fresh Fruit comes with all entrees – PLUS – Chef’s famous home made biscuits covered in honey butter! Eat in the Dining Room or the Great Room in front of a roaring fire! Your choice!